“We are facing an epidemic of a magnitude never before seen in terms of the distribution of cases in the country” Mariano Lugli, Coordinator, Medecins Sans Frontieres, Conkary, Guinea (Mar, 31, 2014). Ebola Zaire, one of the deadliest variants of the virus has once again broken out in Africa. For the first time in its history it has emerged in Guinea and subsequently spread to Liberia. Unlike many of the former outbreaks it is not isolated to one or two villages or regions but spread out across Guinea into several prefectures. The current outbreak, which is ongoing, has seen 112-persons infected with 70-deaths in Guinea and in neighbouring Liberia up to seven-persons with two deaths. Both outbreaks are fluid and those numbers may increase or decrease as confirmation of case numbers solidifies or the virus spreads further. See the latest World Health Organisation (WHO) Disease Outbreak News (DON) from both Guinea and Liberia for the latest details. As part of a post-graduate study program that I am undertaking I am building a five-minute lesson in which I plan to explain the Ebola Haemorrhagic Fever (EHF), in layman terms to pre-service teachers in five graphs and six dot points supplied by WHO. Here are the dot points and the first graph (with more to follow). 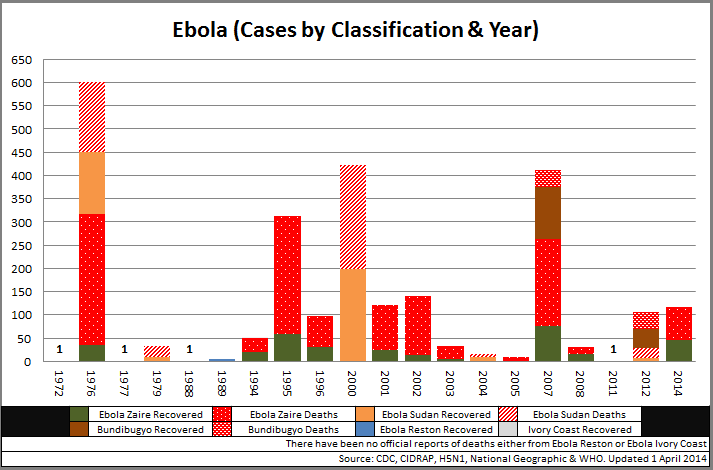 The first infographic shows cases by classification (Ebola Zaire, Sudan, Bundibugyo, Reston and Ivory Coast) by year and then split into those recovered or those deceased (following in a red variant). As you can see the initial outbreak of the both Ebola Zaire and Sudan in 1976 was the most significant with 603 cases and 431 deaths (a combined Case Fatality Rate of 71.5%). With up to 119 confirmed cases so far the 2014 outbreak numbers are already seventh in terms of case numbers. Acknowledgements: Data for this infographic was sourced from official reports from the World Health Organisation. I have also utilised resources from the CDC, CIDRAP, H5N1 and National Geographic.